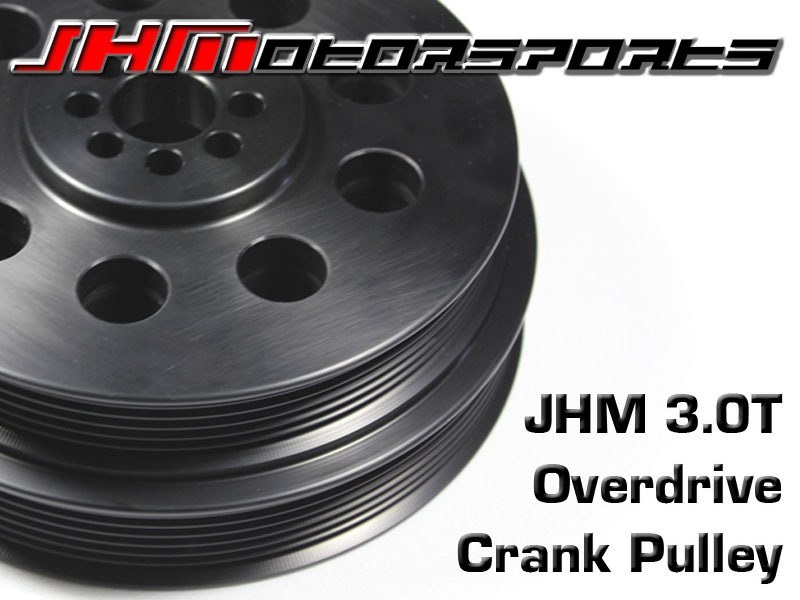 Introducing the JHM HD OVERDRIVE Lightweight Crank Pulley for the 3.0T FSI!!! NOTE: This JHM Overdrive Crank Pulley is an alternative for other companies' smaller supercharger pulleys and will require stage 2 software. If you already have a smaller supercharger pulley or you are looking to upgrade your crank pulley without requiring a software change, see our JHM Lightweight Crank Pulley for the 3.0T. However, a current popular modification is to "double up" or run "dual pulleys" which means running a smaller supercharger pulley in conjunction with an overdrive crank pulley. However, following the launch of the JHM Overdrive Pulley has been a flood of other overdrive pulleys on the market that combined with a smaller supercharger pulley will spin the OEM Eaton 1320 Supercharger far outside of the designed efficiency range which can result in a huge loss of reliability and longevity. If you decide to go with a "dual pulley" setup, using the JHM Overdrive Pulley will be your safest bet. As of March 2017 the APR Ultracharger throttle body upgrade kit with software is an excellent upgrade to let the "dual pulley" setups really breathe and make more power. We sell this product as well. JHM has been making Lightweight Crank Pulleys for Audis since early 2009. We developed our first Lightweight Pulley for the B6-B7 S4 then came the B7-RS4 Lightweight Crank Pulley. That was followed by the 6-rib pulley systems we developed for our B6-B7 S4 and RS4 Supercharger Kits. After the release of the Supercharger Kits, we came out with a Lightweight Crank Pulley for the B8-S5 4.2L, then the 2.7T, the 3.0L V6, and the 2.0T FSI. We've also developed a 6-Rib Pulley Upgrade Kit for B6-B7 S4s and RS4s that aren't supercharged. Following the success of our Lightweight Crank Pulleys and after hearing of several pulley failures on the 3.0T FSI, we decided to come up with two JHM solutions for a failure prone Audi part. We already released our JHM "HD" Lightweight Crank Pulley for the 3.0T FSI engine in July 2015 and now we're pleased to release the JHM "HD" Overdrive Lightweight Crank Pulley for the 3.0T FSI! WHY THE JHM "HD" OVERDRIVE LIGHTWEIGHT CRANK PULLEY? 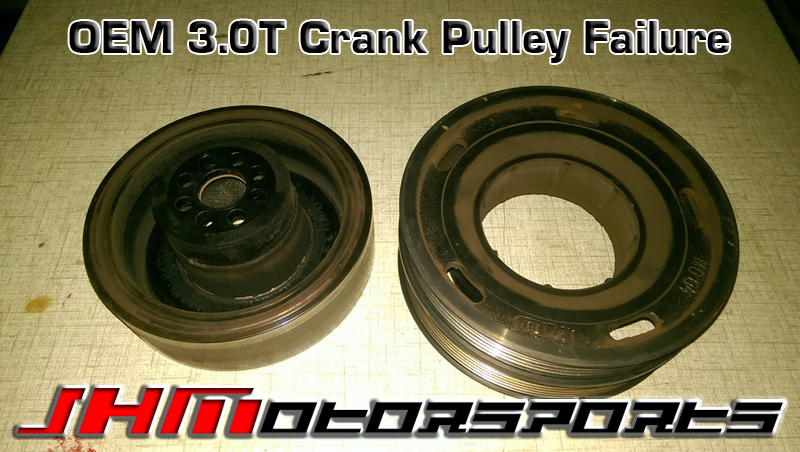 The OEM 3.0T Crank Pulley is actually two pieces connected by a rubber isolator. The center hub or inner piece bolts to the crank which is joined to the outer by the rubber isolator. We have seen several failures where the inner portion of the pulley separates from the outer at the rubber isolator connection. This leads to a major belt failure and can cause serious damage to the radiator, radiator fans, accessories, and other pieces behind the core support. - Just like the JHM "HD" Lightweight Crank Pulley, the Overdrive Lightweight Pulley also eliminates the two piece design and rubber isolator found in the stock crank pulley while also reducing the mass of the motor's rotating assembly. 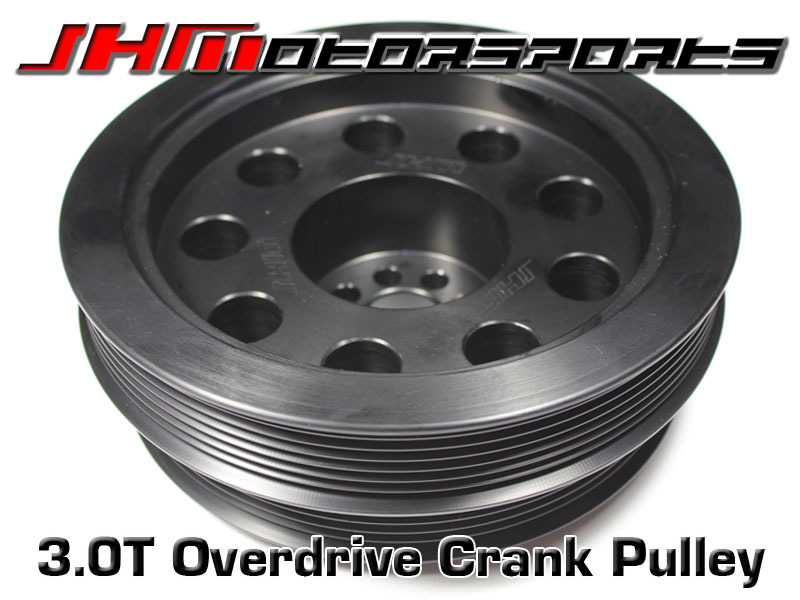 - Additionally (and most importantly) our Overdrive pulley has the same supercharger overdrive ratio as all of the other popular stage 2 supercharger pulleys on the market. This allows you to achieve the same supercharger speed required for most companies' stage 2 tuning without having to purchase special tools or scar the stock supercharger pulley with installation marks. Installation of our Overdrive pulley is completely reversible! - Converting to a single piece, solid crank pulley without the rubber isolator will prevent separation of the crank pulley and damage to your motor and/or accessories while reducing the rotating mass of the engine's rotating assembly will also free up horsepower. 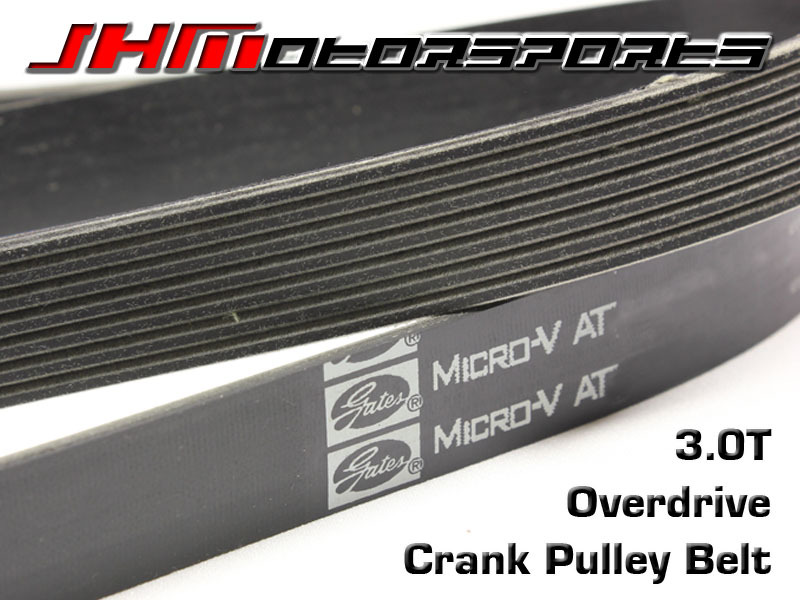 - The JHM Overdrive Crank pulley achieves the same supercharger speed as a smaller supercharger pulley while increasing the total amount of belt contact in the belt and pulley system. When you decrease the size of the supercharger pulley there is less surface for the belt to grip the pulleys which can lead to slippage. Our JHM Overdrive Crank Pulley increases grip and prevents slippage. - Our JHM "HD" Overdrive Lightweight Crank Pulley is anodized black to look stock and blend in. - Though this is not recommended, we have had independent reports from our customers who have used our JHM Overdrive Crank Pulley along with a smaller, aftermarket supercharger pulley to "double up" and spin the supercharger even faster. Spinning the supercharger faster may increase wear and could shorten the life on the unit. Please consult with your software provider before "doubling up" on our Overdrive Crank Pulley and a smaller supercharger pulley. That's a weight reduction of over 40%!!! Our JHM "HD" Overdrive Lightweight Crank Pulley installs just like your OEM pulley. So, just like you must do with the OEM pulley, make sure that the offset bolt hole on the JHM Crank Pulley matches up to the offset hole on the crank. Then, torque all supplied crank pulley bolts to 20 ft-lbs in a star pattern. We also recommend using Loctite.